New Scooting Records and an Alien Test! Good news! Only one more day on my scooter and I’ll reach 2000 kilometers. I have also scored new daily records. 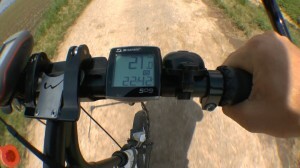 Yesterday I “scootered” 83 kilometers, today I managed 82 kilometers. I am absolutely exhausted. But my tight time schedule forces me to do this. I have only 15 days left for the last 500 kilometers to my final destination – Germany’s most southern point! On my way I stopped in Mannheim and visited the so called UFO Reporting Office. It’s no surprise that this unusual office exists, because 40% of the Germans believe in extraterrestrial life! 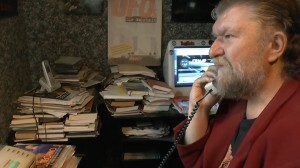 Werner Walter who runs the office told me that many people call him because they believe to have seen a UFO in the sky. He explains them that these sightings often have very earthly reasons: operations of the Air Force, lasers from discotheques or candle-powered balloons. So I conducted a street test. I asked people on the street, dressed as an alien. Germans do believe in aliens, but would they also take one home, if the alien tells them that his space ship had an accident over Mannheim? The result was disappointing. Only 33% of the people agreed to accommodate an alien. Germans do believe in them but are very cautious when it comes to take one home. Germans, please be more hospitable towards aliens!